CIE Chromaticity Diagram is based on the principle of mixing different proportions of three hypothetically primary colors (not necessarily red, green and blue), owing to which we can trigger the perception of all the light colors in the human eye. The three primary colors are marked as “X”, “Y” and “Z”. If we are interested only in the color of light, not in its intensity, we can determine only the relative intensity of the three colors and mark them as “x”, “y” and “z”. Since the sum of “x” + “y” + “z” must be 1 (100%), it is sufficient to provide only “x” and “y” values as “z” is the default.Thus, lamp color may be presented in a two-dimensional graph with coordinates “x” and “y”. All possible colors can be shown in the graph in the shape of “a triangle with a rounded corner.” On the perimeter there are only monochromatic colors (in nature they can be seen in the rainbow) from red to blue. 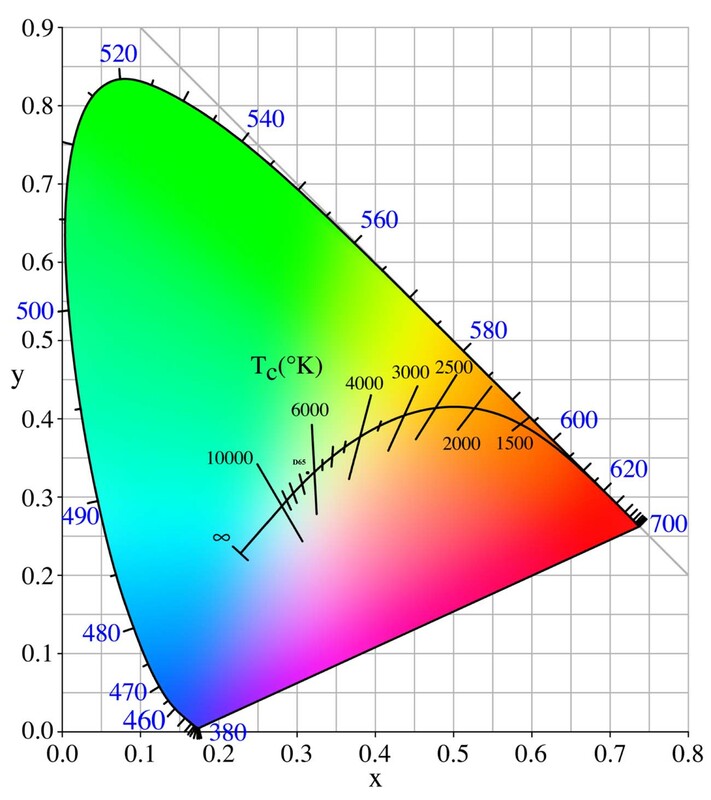 The colors of light emitted by the incandescent object which changes its temperature, can be presented on a Chromaticity Diagram (CIE) at the central white region as the curve (Blackbody curve). Two lamps whose x and y coordinates occur above and under the curve respectively, may have the same color temperature (CCT). However, for the lamp with the coordinates above the curve, the light is slightly greenish, and the other lamp emits the slightly pinkish light. This explains why the two lamps having the same color temperature (CCT), emit different light to the human eye.